If an EET 3.0 or 3.1 experiment is updated to an EET 3.2 experiment, we recommend that users also update the method used to save the gaze data. Older versions of EET use a mixture of PackageCalls (i.e., TETOpenGazeDataFile and TETCloseGazeDataFile) and script (i.e., User and InLine script) to save gaze data. 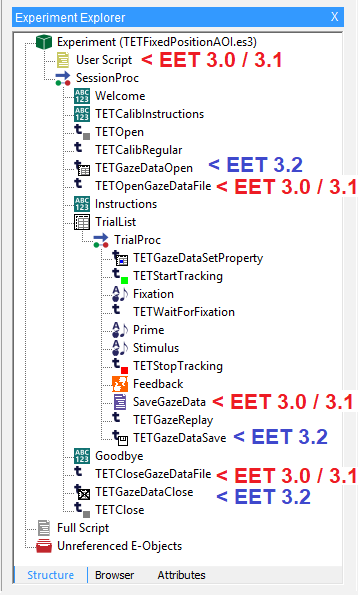 EET 3.2 introduces new PackageCalls (TETGazeDataOpen, TETGazeDataClose, TETGazeDataSave) and does not require any script in order to save gaze data. For example, the Hit Test (determines what the participant was looking at during the experiment) is calculated by the TETGazeDataSave routine in the EET 3.2 PackageFile. This negates the need for the Hit Test script in the SaveGazeData InLine. EET 3.2 continues to support the older method, but we encourage the adoption of the 3.2 release-specific method. The image below illustrates both approaches. NOTE: EET 2.0 is configured in the same manner as EET 3.0 / 3.1. Pupil gaze data is now included by default in the file (see INFO: Obtaining Pupil GazeData in EET 3.1 ). TETGazeDataSave can be configured with the vStimulusName parameter to log the dependent measures (i.e., ACC, CRESP, RESP and RT) for a stimulus presentation object. The 3.2. file allows users to write data based on conditional statements with the TETGazeDataSetPropertyMatch and TETGazeDataSetPropertyNumeric PackageCalls. TETGazeDataSetPropertyOneShot allows for a single value to be sent to the gaze data file at a specified time. We do not recommend having both save gaze data methods in an experiment at the same time. The EET 3.2 save gaze data method has proven to be faster than the older method (1 second for 45 seconds of 1200hz data as opposed to 7 seconds in prior EET versions). Having both methods may add unnecessary delays to trials due to the time required to process the gaze data twice and save it twice.